Love to be mesmerised and thrilled? Me too – and that’s why the exhilarating Tiger and Tiger Tale (+6) are not to be missed. 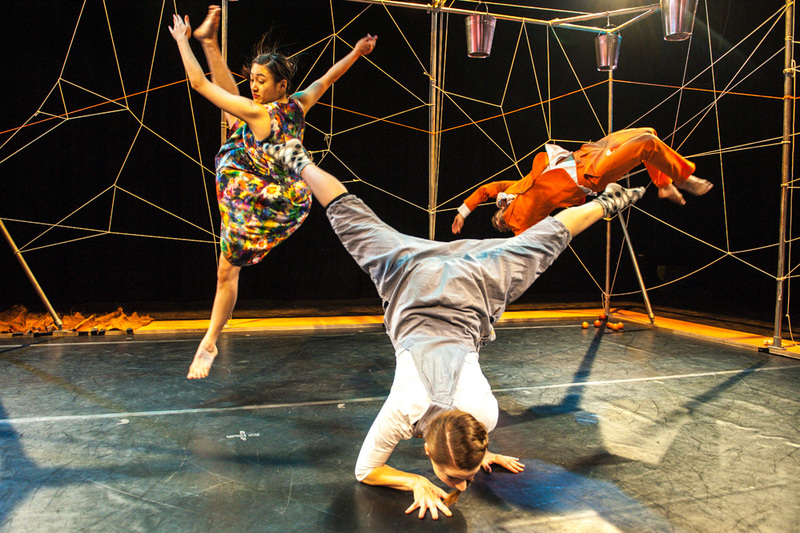 This wonderful piece of dance theatre by Barrowland Ballet is told in two spectacular shows – one aimed at children and the other at adults. The story introduces us to a family stuck in a routine – a cleaning obsessed mother with a dutiful husband and a daughter desperate for attention. Their world is pretty ordinary, bland even. And then something magical happens, something starts to infiltrate their lives…the Tiger. Magnificently chaotic, alluring and dangerous – I won’t give anymore away other than to say you must meet this wonderful tiger in his fine orange suit. Beautiful movement, acrobatic dancers and fantastic music will have you totally transfixed. The live music performed throughout the show adds to the emotional resonance. It’s a sensory delight. So don’t be shy! Nab one of the front row seats and get as close to the action as you can. The set is more like an art installation with metal scaffolding and a cat’s cradle of silken strings for the performers to play in. The unique looking buckets hanging from the ceiling are truly cool. It has been touring but is coming to the Tramway in Glasgow on 25 and 26 October. So get your tickets for Tiger and the kid’s Tiger Tale. You won’t be disappointed. Step away from the ordinary and get some Tiger in your life. Grrrrr!